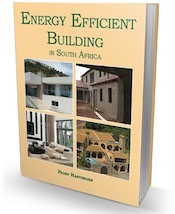 SANS10400 are the Building regulations in South Africa, and both international and national standards, are fundamental to successful building and construction projects, both big and small. Is This Electric Fence Legal and Compliant? Did you Know the NHBRC Can Send You to Jail? Nkandla – At What Cost? Are High Ceilings a Waste of Money? 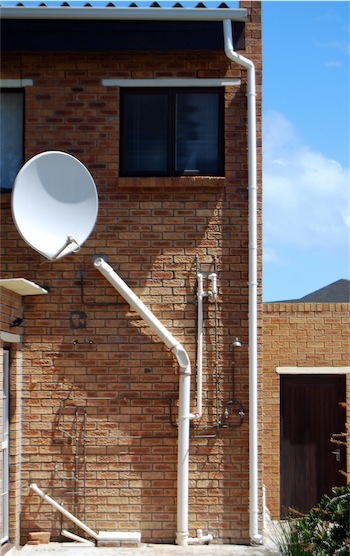 Drainage and plumbing is not only what you see above ground. All water, waste disposal, soils and stormwater have to be drained away and treated to maintain safety and health. In many instances these pipes cannot be seen as they are buried underground and have to be installed by a qualified plumber using the correct pipework. There are two tables below Table 5 for residential accommodation and Table 6 for personnel in the workplace these are extracted fron the SANS 10400 Part P – Drainage. Hi Penny.I recently moved into my new property & discovered that my new neighbors connected his sewer pipe onto my pipe on my property the very same day I moved in.Ironically they were living on my property before they were legally evicted & unfortunately moved next door which was a vacant plot.I’m not even sure if they are squatting but he insist its his property. Anyway when I confronted him about the sewerage connection he claims 2 properties shares a sewerage connection which then obviously runs to the mains outside.I then ask him to show me papers to confirm his claims or who gave him permission to dug trenches on my property without my consent. He only showed me an areal template of the 2 properties with red arrows indicating the layout of the sewer pipes but it clearly does’nt indicate it being connected to my drainage pipe. I not an expert on plumbing but this doesn’t sound right.What if there were a concrete fence in place & my drainage system gets blocked .I did inform the municipality regarding this matter & they informed me they will send out a building inspector but its been a while now & I’m still waiting for someone to assist me. You need to rattle cages very loudly. Phone the council every day – or better still go there and insist they send a building inspector to investigate. If you can identify the erf that the neighbour is living on, you should be able to find out who owns the property. Maybe a local estate agent can help you. I walled an area in my courtyard that had an existing shelter, making the sheltered area into a tiny room. Problem is that there is a toilet outlet and it is now considered to be “under-roof”, so part of the pipe coming from the wall is above concrete. I put a melamine box around the pipe with a granite lid, for easy access to the sewer pipe. Apparently it is not right. How do I fix this? For starters, if you have converted the courtyard into a room then the council likely would have required plans. A registered plumber would need to be involved when it comes to sewers and any other drains. My sewerage line coming from the back of the house is running at an angle across the yard to the connection in front to join main sewerage line in the street. I am planning on building a garage accross this area. My question now is. Can you leave sewerage line (owner side) as is and built over it or do I have to relocate pipes? If I need to relocate pipes can I do this myself as I am a good diy person? You will need plans drawn by a competent person before you can build the garage. Chances are you will be able to build over the line as long as you don’t cover manholes or inspection eyes. You cannot relocate pipes or drains … this must be done by a qualified, registered plumber (or under direction of same). We are leasing a building with insufficient access to toilettes. There about 40+ people in the building. 2 Female toilettes, 1 urinal, 1 male toilette and 1 disabled toilette. The landlord wants to close of the disbaled toilette as a unisex toilette for another tenant. I dont think this is correct or legal. Some advice would be appreciated. This is contained in Part P of SANS 10400, Drainage. You will find the relevant tables here. I did plumbing installation on a block of flats , Now everything is installed and they want me to do a test. Which test can l use and how do l go about doing it? If you are asking us this question, you are clearly not a qualified, registered plumber. This will also mean that the installation is illegal. You could check with one of the FET Colleges, a plumbing textbook I wrote for them a few years ago detailed all the tests. I have a question relating to the plumbing vents that need to be installed on a property. I live in a complex, and there is a horrible smell and noise that comes from our shower drain when the neighbours shower. A plumber who regularly services our complex said that the reason is that the complex has no vents. He says he has brought it up with the body corporate a few times but they ignore him. Is there a legal requirement (what are they?) to have vents installed and can I force my body corporate to do something about it? Vents would normally be required – and the plumbing installation should have been done in accordance with approved plans. So the first thing to do is source the plans and see if plumbing was done correctly, according to plan. Also, someone at IOPSA might be able to help. Seeing as the other main lines are under paving, can I lay the concrete slab over the sewer line? Can I then also continue with building a low 40cm high planter/ waterfeature with seating over a section of this edge of slab? It shouldn’t be a problem as long as the inspection eye is accessible. I’ve just had a plot and plan home built and noticed a lot of pooling in certain areas around the house. Is it reasonable to expect the builder to take steps to improve the drainage at his cost. It was his plot and architect. The soil is “clayey” and both the builder and architect have built several times in the area. I have an existing building and i do not have a storm water drainage in front of my house. My house is below road level and i have been relying on my neighbours who were good people, they allowed me to bore a hole through the side wall into their yard for the past ten years. My neighbours semi-detached house is now sold and I am afraid that the new neighbours will not allow us to use their yard as our storm water drain. Your neighbours have no reason to allow you to drain stormwater onto their property. Please read this article for clarification. Good day, we are busy updating the living arrangements for our farm workers. 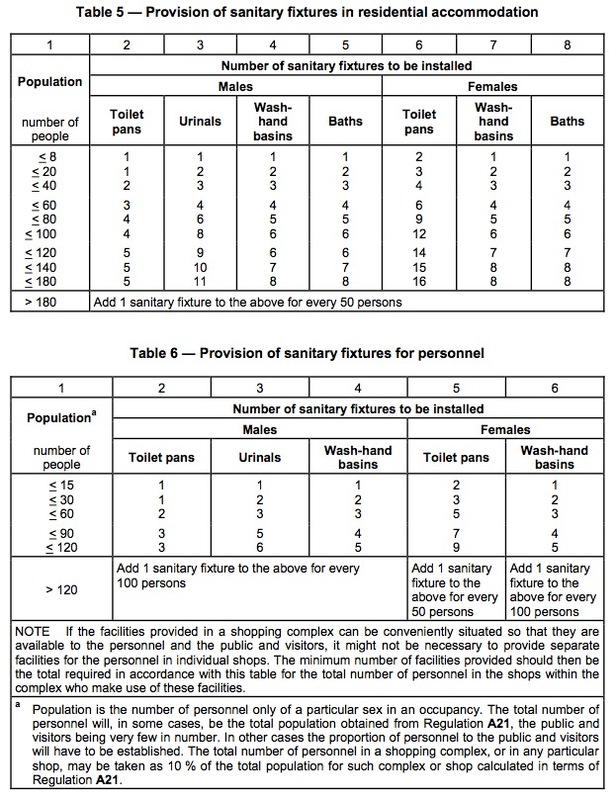 My architect is not sure about the exact number of toilets necessary for the workers and whether the above table applies as it is informal and with only a few permanent workers and seasonal temporary workers. This very basic information is freely available in the NBR – your architect ought to be checking the regulations and not expecting his/her client to find the answers! Please note that we do not replicate the NBR on our site, but simply give useful guidelines. There are a number of other tables in SANS 10400-P, Drainage. I suggest your architect buys a copy. I’m interested to know the regulations around the use of and prohibition of Polycop Piping in residential homes and would greatly appreciate if anyone can refer me specifically to a SANS STD. Contact the SABS, they will tell you which SANS have information about Polycop piping. Hi im busy with a little office on a farm. In indicating the septic tank 3meters away from the building. Is that adequate enough or could i move it closer perhaps 1.5meters from the building? Your help will definitely be appreciated. From my understanding, the minimum distance of septic tank from house is 6m! Please read our Terms & Conditions before acting on any advice given on this website. NHBRC lays criminal charges against Natal Home Builders.